To understand this issue, one fact is crucial: it is NOT TRUE that we must allow this technology, otherwise children with genetic diseases will continue to suffer. Families which carry genetic diseases can avoid the birth of affected children by using existing safe and reliable technologies. In fact, it is completely unethical to subject children to the risk of dangerous new technologies, when safe alternatives already exist. People who try to frame the issue as, ‘benevolent scientists trying to cure sick babies’, or ‘permit genetic modification or children will suffer’ are either misinformed or are trying to emotionally blackmail you. This is standard practice in campaigns for legalisation of new reproductive technologies – critics must be portrayed as uncaring. Like everyone, members of this network have personal experience of genetic diseases. In fact, some of our leading supporters are geneticists. We are not trivialising the suffering involved in some genetic conditions, only insisting that the technologies to deal with these issues already exist and that new risky technologies should not be used. Please also see the note below on prenatal testing, disability and eugenics. But where genetic modification can go beyond existing technologies is in the area of ‘enhancement’, i.e. designer babies, and that is where its real market will be. That is why we are launching this campaign: to highlight the dangers for global society if this technology leads to a new eugenics, based on a free market in genetic ‘enhancements’. Equality and freedom from discrimination: a society in which some children are genetically modified to have greater abilities than others has abandoned the basic idea of human equality. How acceptable would it be to be disabled in such a society? In the 20th century eugenic discrimination was driven by existing oppressions, especially race, class and disability oppression. It designated people with mental health problems or impairments as a ‘social burden’ to be eliminated. A free-market eugenics, operating through parental choice, would allow wealthy people to give their children even greater advantages over other children. It would allow oppression to determine which kinds of human beings are allowed to be born. We have seen how sexism, empowered through prenatal scanning, has led to more than a hundred million missing women in Asian countries. 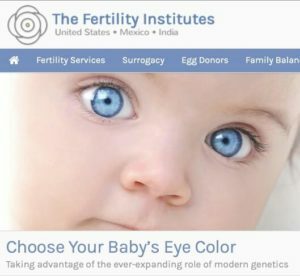 There are already examples of free market eugenics operating now, especially in the US egg and sperm donation markets. In a global climate of rising authoritarianism, a designer baby free-market could quickly collapse into state-controlled coercive eugenics. Children’s rights: the term ‘designer babies’ was coined in the 1980s to mean a consumerist attitude towards children. The basic rule of parenthood is to love your children whatever they are like. But if parents control their children’s genes, to choose their appearance or abilities, they are dominating them in a radically new way. They would be turning them into just one more designed and optimised commodity. Rather than having hopes about their children, they will have expectations of how their investment will perform. We think it is a basic right of children not to be manipulated in that way. Responsible innovation: there is no medical need for the creation of GM babies, and every new scientific advance shows us how little we understand of the workings of nature. Yet, ambition and the desire to make money pushes scientists to rush to market. Driving ahead with such research risks endangering public support for responsible biomedical innovation. Scientists and biotechnology corporations must show that they can control excesses and accept ethical limits. Technology, humanity and nature: many environmentalists, feminists and other philosophers have argued that Western technology tends to try to control nature and human beings too much. Of course, we have to use technology. But there is a technocratic way of thinking, which came into Western societies in the Scientific Revolution of the 17th century, that wants to turn the world into one big efficient machine. This drive for control, coupled with an inadequate scientific understanding of nature, is clearly a major cause of the environmental crisis. Such concerns were at the root of the campaign against GM food in Europe. Human genetic engineering is about incorporating human bodies, at a genetic level, into the vast system of technological control of industrial societies. We think the misguided desire to ‘fix’ and ‘improve’ everything, to control human nature, undermines our humanness and freedom. The ‘transhumanist’ desire to technologically upgrade and ‘transcend’ humanity is that same dream of power and control. We humans don’t want to be transcended, thank you. Let’s fix the social problems that are leading to inequality, eugenics and environmental disaster instead. If these arguments make sense to you, join the campaign. In arguing that there are safe alternative ways to prevent genetic diseases, we realise that an important issue has not been dealt with. Is it is ethical and socially desirable to prevent the birth of children with genetic diseases at all? Whilst many people regard this as a non-issue, many disabled people feel that the practice of prenatal testing and screening is a continuation of earlier practices of eugenics. They argue that these practices reflect society’s wish that they did not exist. In a society that is making progress towards inclusion of disabled people, they argue, prenatal screening pushes us in the opposite direction, and perpetuates oppressive concepts of normality. This is an extremely difficult issue, which is beyond the scope of this campaign. Many members of this network have much sympathy with the disability rights’ movement’s arguments, and some of us are disabled people. We have argued that the techniques mentioned above make genetic modification unnecessary, but that does not mean that we agree that it is always right to prevent the birth of children with genetic impairments. That issue can only be resolved through a long-term process of social dialogue, which some of us have made big efforts to encourage. Here, we only wish to point out that, whatever your views on this issue, human genetic modification is unnecessary.